SunSine® AC solar module, 275 Watt (AC STC), 120V, 60Hz output for grid tied connection, UL listed with Class A fire rating, 325W PV module with built in DC-AC inverter, heavy aluminum frame, double glass construction, 20 year PV power and 5 year Inverter warranty. The SunSine® 325 is a large area AC module with an output of 275 Watts (STC) of 120V, 60Hz AC power designed for a direct utility intertie system. It is equipped with quick-connectors for fast, flawless field wiring and is compatible with Ascension Technologys RoofJack mounting systems. Development of the SunSine® was supported by the U.S. Department of Energy and over twenty electric power companies across the nation who helped test this product for grid-tied PV power applications. Designed to be NEC-compliant, the SunSine® was the worlds first Underwriters Laboratories Listed AC module. The SunSine® has maximum power point tracking, morning start-up and evening shut-down, over/under voltage and over/under frequency protection and both active and passive islanding protection. UL Class A fire rating - Permits module mounting on any roof without compromising the roof's fire rating. Protective features meet IEEE 929-1988. Complies with FCC Rules, part 15, limits for class B digital device. Will not interfere with home communication devices. 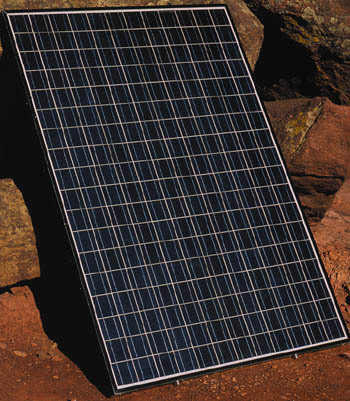 Solar Cells: -- 216 crystalline silicon cells, each 100 mm sq. Less potential for lightning damage because of NO DC system wiring, and transformer isolation between AC output and internal DC connection to the PV. Eliminates expensive and hard-to-find dc-rated switches, fuses and other components. SunSine® AC modules are inherently safe. They produce no output until correctly connected to the grid. Most Reliable AC Module in service today!! Passes IEEE C62.41-1991. C62.45-1992 Surge Withstand testing without hardware failure or loss of protection functions. 60 Hertz Transformer Isolation provides the best protection from ground faults and surge currents from module to module or module to utility voltage. The SunSine® reduces system design to a simple matter of choosing how many AC modules to utilize. It is no longer necessary to configure a PV array to match the voltage, current and power input requirements of a conventional central power conditioner. Systems can be configured for 120/240 Vac single-phase or 120/208 Vac three-phase installations. Equipped with quick connectors for fast, flawless field wiring. Compatible with RoofJack mounting systems. Includes pre-assembled mounting pins for RoofJack mounting hardware. SunSine® AC modules are fully integrated and require no DC field wiring. LED indicator shows power output and verifies proper operation. Ground shipping and handling charges to the continental US for this item when ordered alone are approximately $150 to $190.